Electricity is usually generated in one of two ways. Use in conjunction with other features on the fuel economy page to provide greater depth and other research opportunities for students. 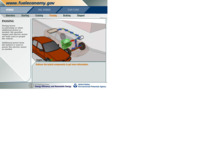 Interactive text-based animation shows how the different components of a hybrid vehicle work during different stages of automobile functioning: starting, cruising, passing, breaking, and stopping. Developed by a reputable source: US Department of Energy - Energy Efficiency and Renewable Energy. Technology is accurate. Comments from expert scientist: Excellent. The description is both precise and concise. It captures the essence of this remarkable technology. One useful addition is that, because hybrid uses the electric motor to carry most of the burden of acceleration, it allows the engine to minimize the task of acceleration, where engine efficiency tends to be low and pollutant emissions tend to be high. Consequently, not only the fuel efficiency improves, the pollutant emissions also decline significantly. Students can develop an understanding of the basic design and function of a hybrid vehicle. The text-based and go-at-your-own-pace design of interactive allows students to progress at different rates. No teacher support materials are provided. MS-ETS1.A1:The more precisely a design task’s criteria and constraints can be defined, the more likely it is that the designed solution will be successful. Specification of constraints includes consideration of scientific principles and other relevant knowledge that are likely to limit possible solutions. MS-ETS1.B1:A solution needs to be tested, and then modified on the basis of the test results, in order to improve it. MS-ETS1.B2:There are systematic processes for evaluating solutions with respect to how well they meet the criteria and constraints of a problem. MS-ETS1.B3:Sometimes parts of different solutions can be combined to create a solution that is better than any of its predecessors. MS-ETS1.B4:Models of all kinds are important for testing solutions. MS-ETS1.C1:Although one design may not perform the best across all tests, identifying the characteristics of the design that performed the best in each test can provide useful information for the redesign process—that is, some of those characteristics may be incorporated into the new design. MS-P6.6:Apply scientific ideas or principles to design, construct, and/or test a design of an object, tool, process or system. HS-ETS1.A1:Criteria and constraints also include satisfying any requirements set by society, such as taking issues of risk mitigation into account, and they should be quantified to the extent possible and stated in such a way that one can tell if a given design meets them. HS-PS3.A5:“Electrical energy” may mean energy stored in a battery or energy transmitted by electric currents. HS-PS3.B4:The availability of energy limits what can occur in any system. HS-PS3.D1:Although energy cannot be destroyed, it can be converted to less useful forms—for example, to thermal energy in the surrounding environment.